It has been a treat to watch Isaac Ratcliffe play this season. He has had ups and downs but ultimately has played well for a middle-of-the-pack team. He has even gone as far as showing pure dominance in some games and taken the team on his shoulders. Not very often do you get to see a 19-year-old that is 6-foot-6 and 200 pounds skate as well as Ratcliffe. Usually at that age, they’re still figuring out how to put the size and speed together. Ratcliffe, however, has figured out the speed part and has utilized it often this season. Ratcliffe has begun to grow into a great power forward. 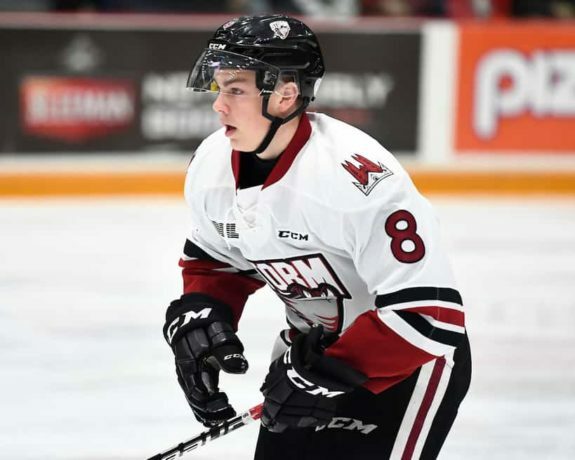 He produced well last season with the Ontario Hockey League’s (OHL) Guelph Storm which led to him being drafted 35th overall by the Flyers in the 2017 NHL Entry Draft. His play this season has been even more impressive with him looking much more comfortable with the puck. He has played more confidently on both sides of the ice which has led to him setting career highs in goals and points and should lead to him breaking his assist record as well within the next couple games. Ratcliffe had a slow start to the season by his standards, especially when you consider he was a top pick in last year’s NHL Entry Draft. He shuffled through a few lines, playing with different players, but just couldn’t figure it out. He posted points but not nearly at the rate that was expected of him. He looked a bit sluggish and was knocked off the puck very easily early in the season. He wasn’t finishing his hits and looked slightly out of place at times. To be frank, his play was underwhelming and disappointing because the expectation was that he would be an offensive force for the Storm as they were starting to take form. Something changed very quickly though as his play picked up significantly, which has led to a strong second half for him. He’s finally looking like the player that he was supposed to be. 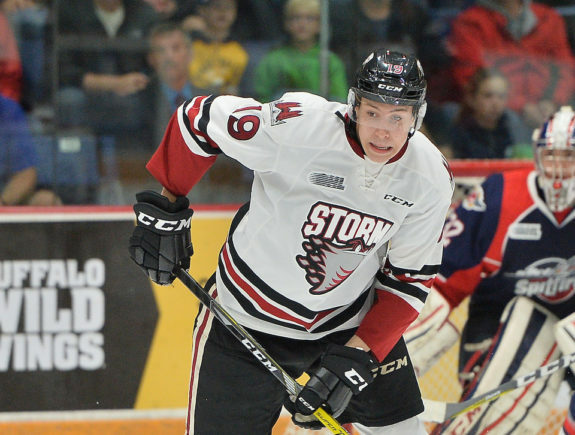 His development is back on track and that should continue as the Storm look to make an impact in the playoffs. Ratcliffe’s goal scoring increased from 5 in the 2015-16 season to 28 last season, which displayed that he had the ability to score goals but no one was expecting him to produce like he has this season. At the time of writing this article, he has scored 37 goals through 61 games played, which is good enough for 0.61 goals per game. He is currently sitting fifth in the OHL for goals and is only eight goals behind the leader, over-ager Aaron Luchuk of the Barrie Colts. 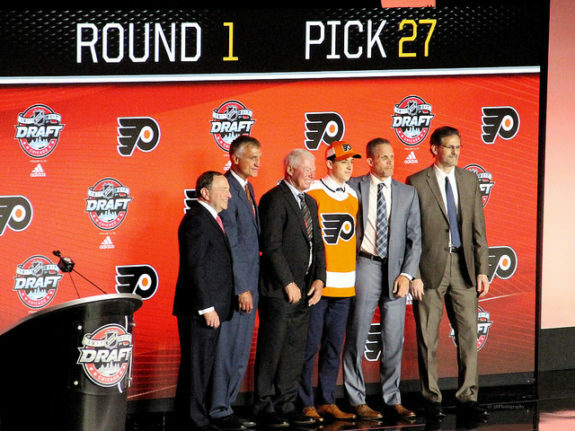 He is amongst good company, including: fellow Flyers draft picks Morgan Frost (38 goals) of the Sault Ste. 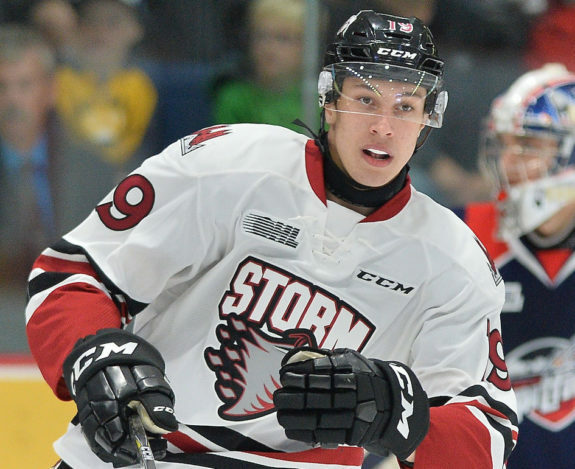 Marie Greyhounds, Matthew Strome (35 goals) of the Hamilton Bulldogs, and Owen Tippett (33 goals), who was drafted 10th overall in the 2017 NHL Entry Draft by the Florida Panthers. He only has a handful of games remaining but getting to 40 goals is not out of the question. The most impressive part of his goal scoring this season has been that he has done it from everywhere in the offensive zone. He has scored directly in front of the net where the traditional power forward scores, he has sniped from the slot, scored with wraparounds, and has also scored on breakaways. He has been unstoppable since elevating his game and appears to have the scoring touch. Generally, when talking about a player who is 6-foot-6, great hands and dangles are usually the last things that come to mind. Usually, a few characteristics that are top-of-mind are: strong on his feet, hits well, net-front presence, and great in the corners. When it comes to Ratcliffe, he has displayed all of those things but he also has good hands. Many defenders this season have witnessed this first-hand as he has stepped around them with fantastic moves. Whether it is a classic toe drag to change the angle and get the puck around the defender’s stick or a nasty through the legs step around, he pulls it off with ease. 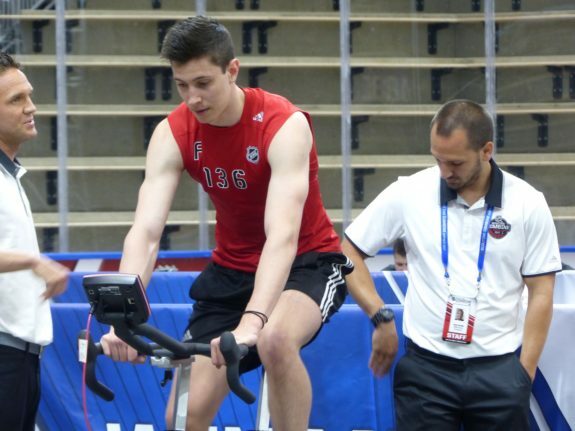 While he will be up against tougher competition when he eventually makes the NHL which will make these moves more difficult, if Ratcliffe can pair his hands with his size at the professional level then he is going to be a tough player to defend. One of the most intriguing things about Ratcliffe is that he can be used in all situations on the ice. Head coach George Burnett has utilized him on the first line, first power-play unit, penalty kill, and in the winding moments of the game to help protect the lead. A power forward with the size of Ratcliffe typically plays either a very offensive game or a very defensive game. In the opportunities that Burnett has presented to him, he has accepted the task and looked great in all situations. He works hard and skates hard every shift and is continually creating opportunities. He has looked good alongside prospect Cam Hillis. In order to make the transformation to the NHL smooth, he will have to be more aggressive and utilize his size better. Ratcliffe has been given a gift with his skills and will have to work hard if he wants to crack the Flyers’ lineup in the coming years. He has the potential to be an electrifying player if he can bring everything together.